The Fiery Seraph is my first attempt at deviating from my usual art style into one that is influenced by the art direction of the Persona/Devil Summoner video game series. In which creatures have a very modern fashion aesthetic that accentuates terrifying and unique features. This creature was designed with a a humanoid look that has a metallic grill mouth with visor eyes supporting a fiery sphere for a head. The body is a cross between armored and biological design with knob plate armor and a circular wingspan that crackles with energy panels. A stylized spear with floating blade tips. Aside from the design aesthetic, the Fiery Seraph is a summon spirit that is basic summon with a quick attack and adequate defense abilities. 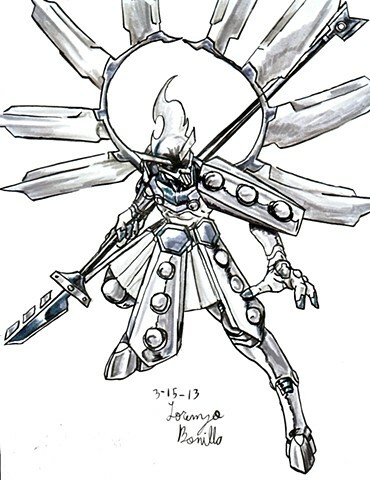 Possessing a solid range attack with the spear and a decent special attack in the solar wing cannon attack. This makes the Fiery Seraph a solid starter Summon Spirit.